If you wish to edit the existing records, follow this step. Choose A in the drop-down menu next to the Type field. 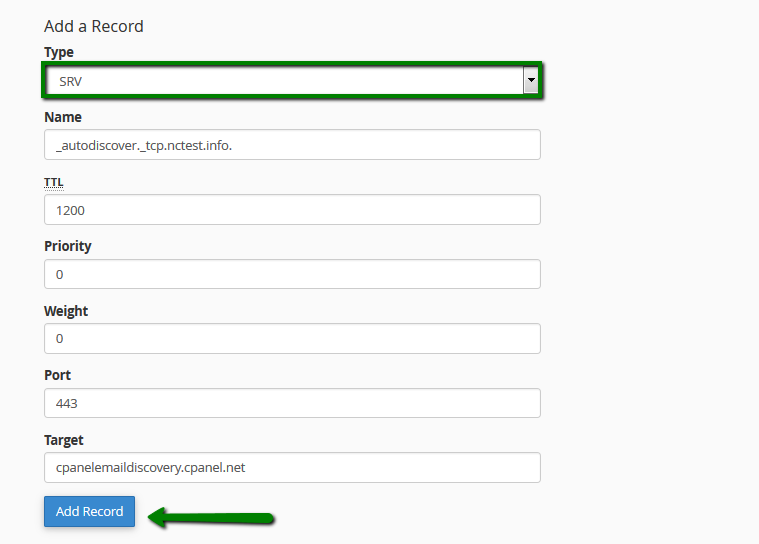 An A record (Address Record) points a domain or subdomain to an IP address. Name: must be a domain with an optional period at the end. TTL: must be a positive integer (in seconds). Address: must be an IP address. Choose AAAA in the drop-down menu next to the Type field. AAAA record, also known as 'IPv6 address record', maps a hostname to a 128-bit IPv6 address in the Domain Name System (DNS). Choose CNAME in the drop-down menu next to the Type field. CNAME (Canonical Name) points one domain or subdomain to another domain name, allowing you to update one A Record each time you make a change, regardless of how many Host Records need to resolve to that IP address. Choose SRV in the drop-down menu next to the Type field. 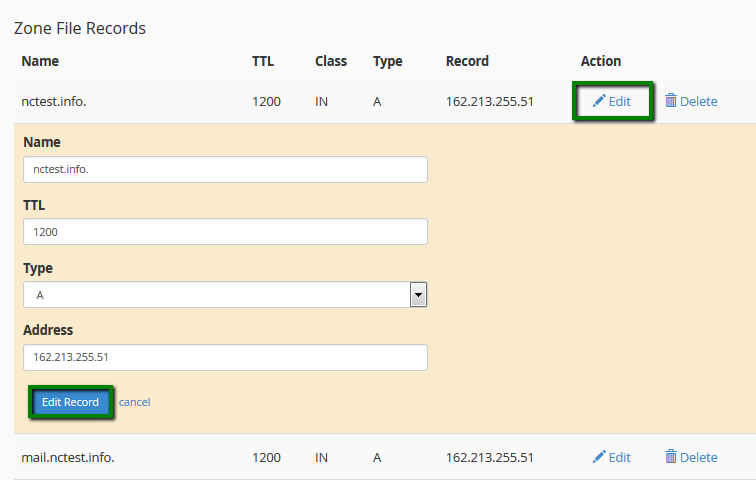 An SRV record points one domain to another domain name using a specific destination port. Choose TXT in the drop-down menu next to the Type field. These records hold a free text form of any type. A fully qualified domain may have many TXT records. The most common uses for TXT records are Sender Policy Framework (SPF), DomainKeys (DK), DomainKeys IdentifiedE-mail (DKIM). TXT records historically have also been used to contain human readable information about a server, network, data center and other accounting information. TXT Data: cannot be empty or more than 255 characters. 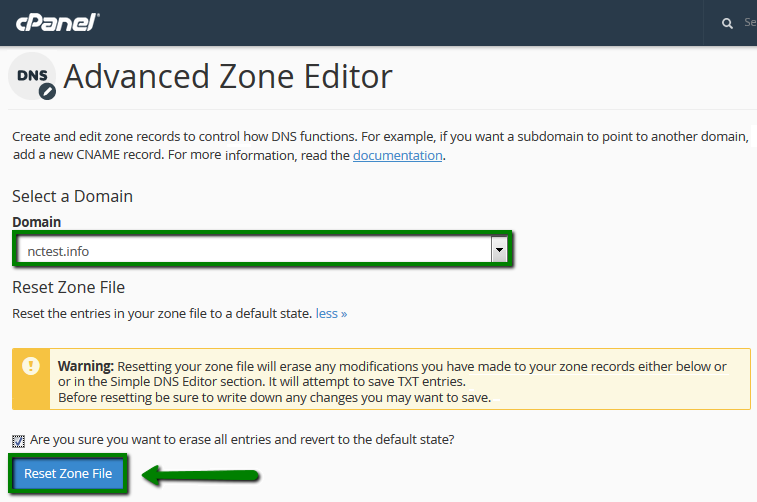 Also, it is possible to reset the DNS zone for your domain to a default one. In this case, the system will erase any modifications you have made to your zone records in this interface or in the Simple DNS zone editor interface. Before you reset your zone file, make sure that you write down any changes that you wish to save.